Your patients will smile more after discovering LumiSmile® White Take-Home. LumiSmile White's proprietary formula will whiten your patient's smile in 1-2 weeks, and is formulated to minimize sensitivity. Choose from 32%, 22% or 16% carbamide peroxide concentrations flavored with real peppermint oil. LumiSmile® White also features an 18 month shelf life, unrefrigerated, so you can stock up! Get your patients LumiSmile® White today! Your patients will smile more after discovering LumiSmile® White Take-Home. LumiSmile White’s proprietary formula will whiten your patient’s smile in 1-2 weeks, and is formulated to minimize sensitivity. Choose from 32%, 22% or 16% carbamide peroxide concentrations flavored with real peppermint oil. LumiSmile® White also features an 18 month shelf life, unrefrigerated, so you can stock up! Get your patients LumiSmile® White today! What is the difference between carbamide and hydrogen peroxides? Carbamide peroxide is approximately 1/3 of the strength of hydrogen peroxide. LumiSmile® White Professional Take-Home Kits are a carbamide formulation. How does peroxide whiten teeth? When peroxide breaks down (either on its own, or accelerated with a light) it forms oxygen bubbles that get down into the microscopic pores of the tooth to clean out stains. Will tetracycline stains whiten with LumiSmile® White? Intrinsic stains (stains inside the tooth, often caused by medications) are more difficult to whiten than extrinsic stains (surface stains, generally caused by smoking, coffee, red wine, etc.). However, good whitening results can be achieved with either system. Lengthier whitening sessions, higher concentrations, or multiple treatments will help to achieve better results. Each patient is different and results will vary. If whitening does not produce the desired results, LUMINEERS® porcelain veneers may be a better option. Each patient is different. There is not a way to determine before the procedure what type of shade change will result. Each patient should be informed of this before treatment begins. What percentages are available with LumiSmile® White Professional Whitening Systems? LumiSmile® White Professional Take-Home kits are available in 16% and 22% Carbamide peroxide formulations. Is sensitivity an issue with LumiSmile® White Professional Whitening Kits? 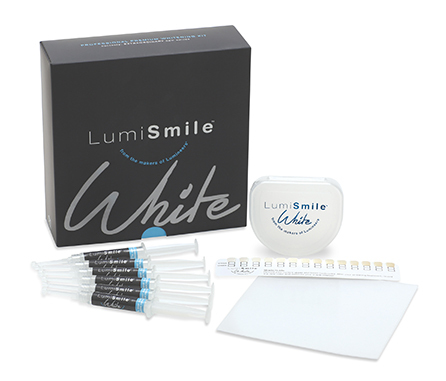 LumiSmile® White Professional Whitening System is specially formulated to eliminate sensitivity.